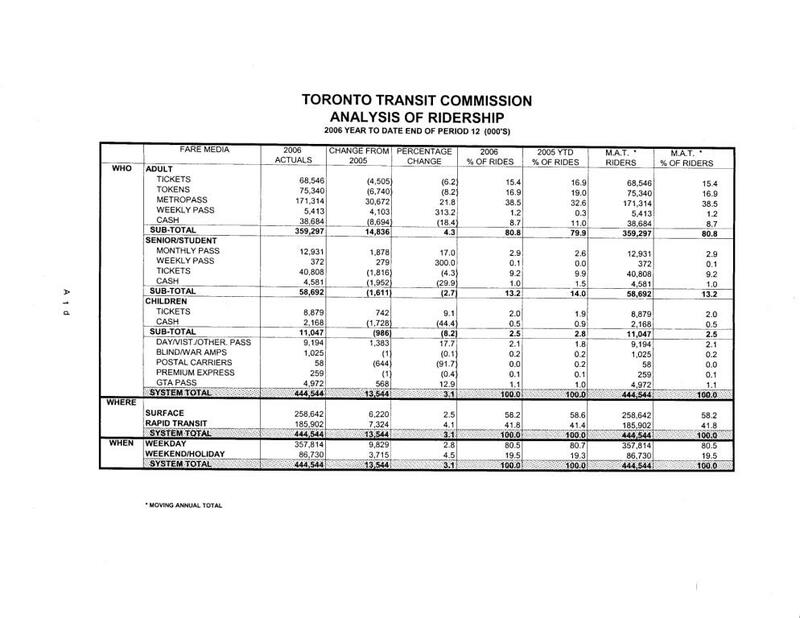 The TTC’s November Commission meeting has been moved up from the planned November 25th date to the 17th, and an item sure to be on the agenda will be a fare increase for 2010. How big an increase will the TTC need? How evenly will the increase be applied to different fare types? As I already reported, TTC management has been up to its usual tricks of blaming heavy use of Metropasses for its financial woes. For months, they have been preparing us (and priming Commissioners) to tell us how we are losing too much money on passes, and their value, relative to tokens, must go up. We have heard this song for years, but through a period when lowering pass pricing was an integral part of the Ridership Growth Strategy, it was ignored. Now, the TTC wants more money, and Metropass holders are convenient, dedicated transit users who can be counted on to cough up almost any increase. What would, what should a fare increase look like? Leaving aside where the missing $22-million will come from, the City has directed that all agencies should reduce their net funding requirements by 5% for 2010. On a base of roughly $400-million, that’s $20-million for the TTC. 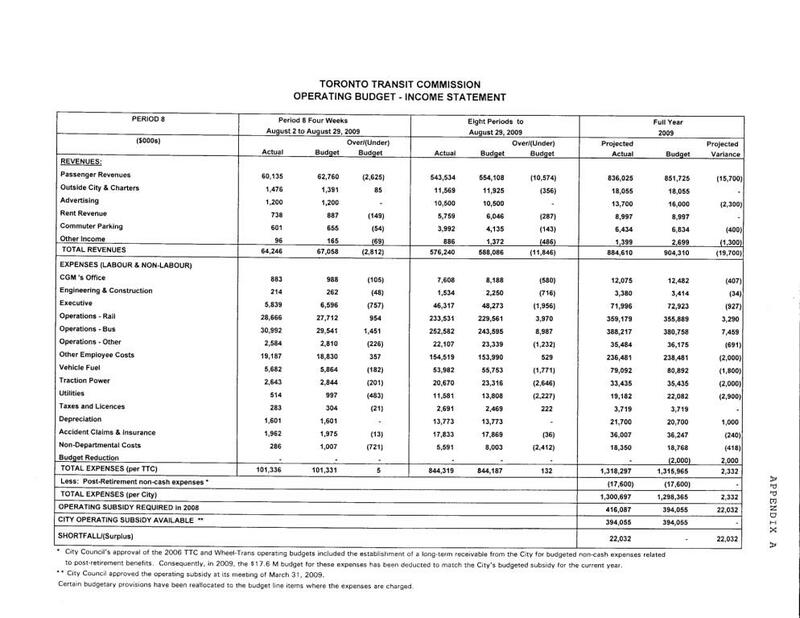 However, we also know from pervious reports that the TTC expects its funding needs to rise by $80-million in 2010, and that brings us to a total of $100-million required in new revenue. Advertising and parking are unlikely to contribute anything, and advertising may even decline continuing a trend from 2009 where the budgetted $16-million is turning into a protected $13.7-million. One has to wonder why we put up with all that advertising on the TTC for only 1% of the total revenue, but that’s a subject for another day. On a straight percentage basis, if the entire $100-million is coming from fares, then the TTC needs to collect 12% more farebox revenue in 2010. However, an increase of this size may deter some riding, and a larger jump, something like 15%, will be needed to achieve the target. Even this assumes that recent experience, in which riders stayed with the TTC provided that service remained good (and “good” is open to some interpretation here), will hold up to a 15% jump. What would this mean for fares, assuming everything went up more-or-less lock-step. Tokens are now $2.25, and they would have to rise to $2.60. Cash fares, now $2.75, would have to rise to $3.15, more likely to $3.25. Metropasses, now $109 ($100 on subscription) would go to $125 (or $115) before allowing for the income tax credit. We won’t know what is actually proposed until, at best, the agenda for November 17th’s meeting goes online probably about November 12th. However, the report itself may be held down as a supplementary item, and we won’t see it until the evening before the meeting. Some talkative Commissioners may, however, start discussing the options in advance to gain debating advantage. It wouldn’t be the first time. Metropass to $130, or $120 on subscription. This would move the fare multiple for passes up from 48.4 to 52 (from 44.4 to 48 on subscription). The Federal income tax credit for transit passes is currently at 15%, and this reduces the effective multiple to about 38 using 2009 pricing for pass subscribers. However, if the base price of the pass goes up, the multiple would also rise (to roughly 41 in the example here). In brief, pushing the Metropass price multiple up will affect over half of all adult rides taken today on the TTC, and a large increase in pass pricing risks affecting the TTC’s single largest market. A fare increase is essential to preserve service quality, but the TTC should leave the relationship between different fares as it is today. If not, they risk screams of outrage from pass holders whose fares will take a big jump for which they will see little or nothing by way of improved service. If my scenario here is alarmist, if I am painting a huge jump in pass pricing that is not actually on the table, I invite anyone from the TTC to make a public statement disavowing such a plan. Stephen, I get your point, I just don’t agree with it or believe that the status quo is a sustainable government policy. We pay for highways, cloverleafs, et al basically out of general coffers but try to make transit a user-pay system. Why is that? The population of the GTA continues to grow. Its a lot cheaper to add transit capacity then to add highway capacity. Therefore, I believe everyone does benefit from a transit tax. But I don’t propose putting a line on everyone’s tax form that says “TRANSIT TAX” just like we don’t see one that says “400 SERIES HIGHWAY TAX”. Transit encourages densification. Highways will make 2 hour commutes the norm. I wouldn’t want to see Toronto turn into one of these places. But back to my original proposal about getting rid of fares. How about easing into it? Make streetcars and buses free (solves loading problems) but require payment to get on the subway system. This would allows centralized, non-vehicle based fare payment and validation. If someone only takes a streetcar/LRT on their commute, good on them. They live close to their job and don’t rely on the taxpayer to support their daily trek. Steve: Much as the idea of an incremental changeover is appealing, remember that subway/surface interchanges are mostly built as barrier-free structures. They would require considerable reworking to implement fare controls for subway entry. Awesomely informative blog, so thanks. I moved here recently from Vancouver and I have to say I’m totally shocked that the TTC talks about (and the press here reports) Metropasses as “costing” the TTC money, as if people who use Metropasses are somehow stealing from the system. In Vancouver, TransLink and the press treat people who buy monthly FareCards as their ridership foundation — or at least that’s how it feels. When we get fare hikes there, they generally alternate between the cash fares and the prepaid fares. The prepaid discount you end up getting is pretty sweet, which overall (I think, at least) encourages regular transit use and thus serves to stabilize and improve fare-based funding in the long-run. I have to say I cannot believe Torontonians put up with one-way fares (we’ve had 90-minute timed fares in Vancouver since the late 80s or early 90s). How on Earth does that encourage transit use? And the recent limitations on tokens? I think there’d be a riot in Vancouver if TransLink tried to limit prepaid fares. Of course, our FareSaver tickets actually have a cash value equivalent to the current fare so if fares increase, you would need to add the difference, I believe, but still… it’s really weird to me how the TTC is treating people in the city like recalcitrant children. I guess the paradigms between the two cities are pretty different but I was surprised to learn (from reading here) that the TTC is one of the least subsidized systems around. Is that a legacy of the Harris government in the 90s or something more historically entrenched? Steve: The TTC did not receive operating subsidies until the early 1970s, and the primary reason they became necessary was the explosion of service into the growing suburbs coupled with the removal of zone fares. Politically, Metro Toronto Council (this is pre-amalgamation) was bing asked to subsidize transit, and the quid-pro-quo was getting rid of the extra fare for suburban riders. “If we’re going to pay for it, we want the same fare as people downtown.”. The level of subsidy was roughly standardized at 1/3 (with that being split between Queen’s Park and Metro), and that formula held until the Harris cuts. Actually, the “formula” worked more like this even before Harris came to power — Queen’s Park and the City decided how much they would give the TTC, and the budget was crafted to make that 1/3 of the total. With Harris, Queen’s Park walked away from transit, and the farebox recovery rate went up above 80% while service was slashed. On the capital side, the old formula was 75% Queen’s Park, 25% City, but in practice that was limited by what both governments, particularly Queen’s Park, wanted to spend. There is no dedicated revenue stream at a level sufficient to pay for ongoing TTC capital maintenance needs, let alone system expansion.